Trading Post, oil on mylar, 8 in. x 8 in. Janelle DolRayne: Can you talk a little about your process? Specifically are the abandoned spaces that you paint imagined? From memory? From a photograph? Dina Brodsky: All of the above. My references include photographs, sketchbook drawings, old master paintings, and objects that make their way into my studio. A lot of the architectural structure in “One More Shelter” came from photographs that I took of a disintegrating old house somewhere towards the tip of Long Island that I found while cycling from New York City to Boston. It had been abandoned for a long time, but you could still sense how beautiful it was when still inhabited, and how much thought and effort went into building it. I borrow a lot of the light in my paintings from Vermeer, studying the way the light in his work travels across surfaces and attempting to do the same. A lot of the objects in the paintings—boots, clothing, tablecloth—are my personal belongings, and I paint those from life. As far as the technical part of my process, I combine the classical oil painting techniques that I have studied—mostly 15th century Northern Renaissance methods and 17th century Venetian techniques—with contemporary materials such as mylar and plexiglas. Roadside Attraction, oil on mylar, 8 in. x 8 in. JDR: In your artist statement you write about being an immigrant and New Yorker, and how in your paintings you want to tell the stories of the places an immigrant must leave behind. 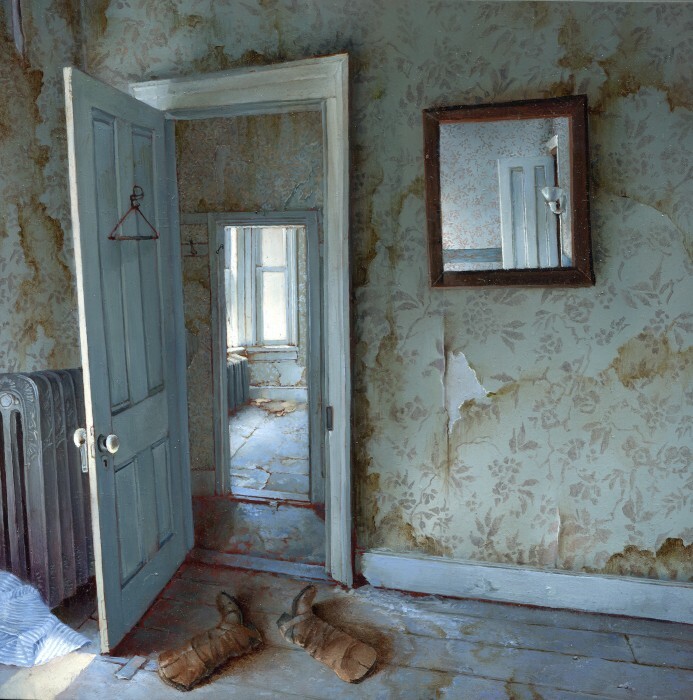 In what ways do these spaces you paint represent your past? 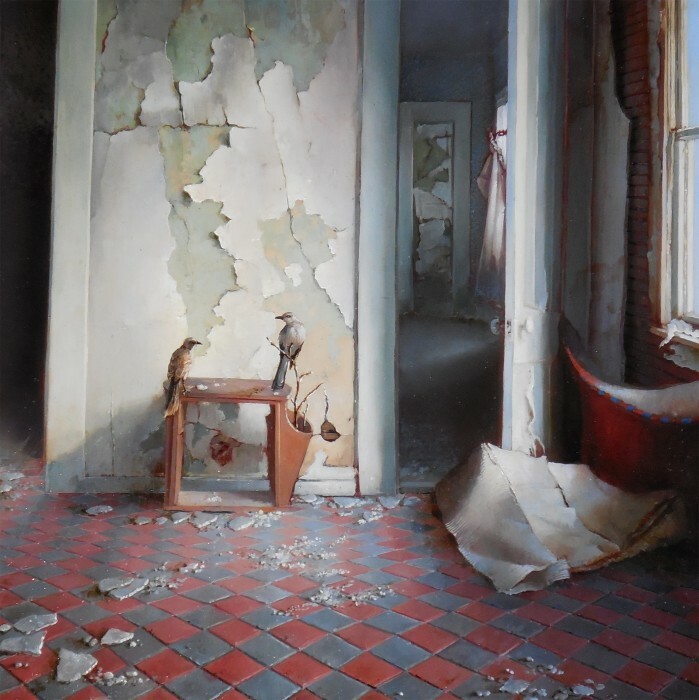 DB: The abandoned places in this series are repositories of memory, an exploration of the effects of time on both the physical and the metaphysical world. These paintings explore the past of others, as viewed through my present. JDR: It’s interesting that the series came from photographs you took while you were traveling, because I think travel also allows us to view the past of others through our present. How much influence did that cycling trip have on this series, if any? DB: I very much agree, as far as travel being a way to view the past of others through our present (as well as allowing us a glimpse into the lives of strangers in general). I go on long distance cycling trips about once a year if I can, and usually fill up a sketchbook and a camera memory card, and use that information to feed my paintings the rest of the year. So yes, that trip in particular, and cycle travel in general, very much inform my paintings. Off Northern Boulevard, oil on mylar, 8 in. x 8 in. 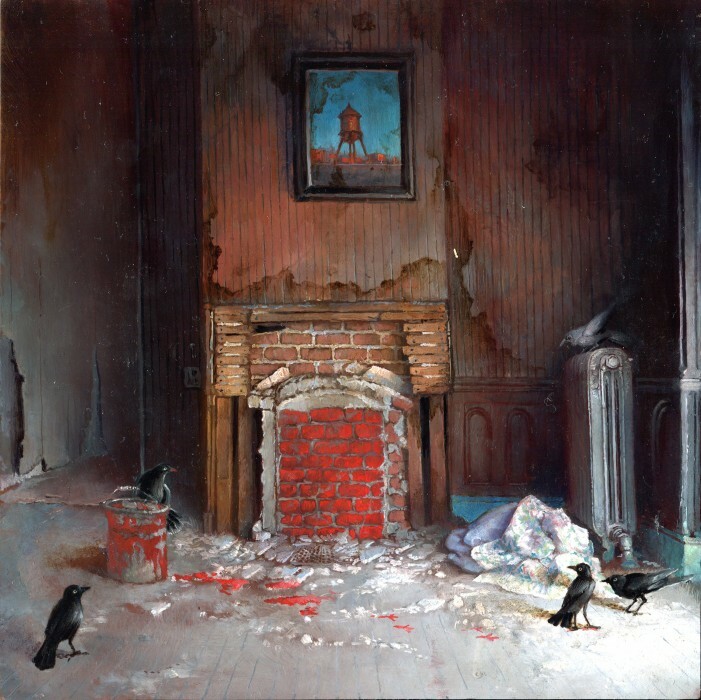 JDR: In each painting there is a subtle sign of living things—a bird, articles of clothing, bright red wet paint, etc. Why have you chosen to include these? 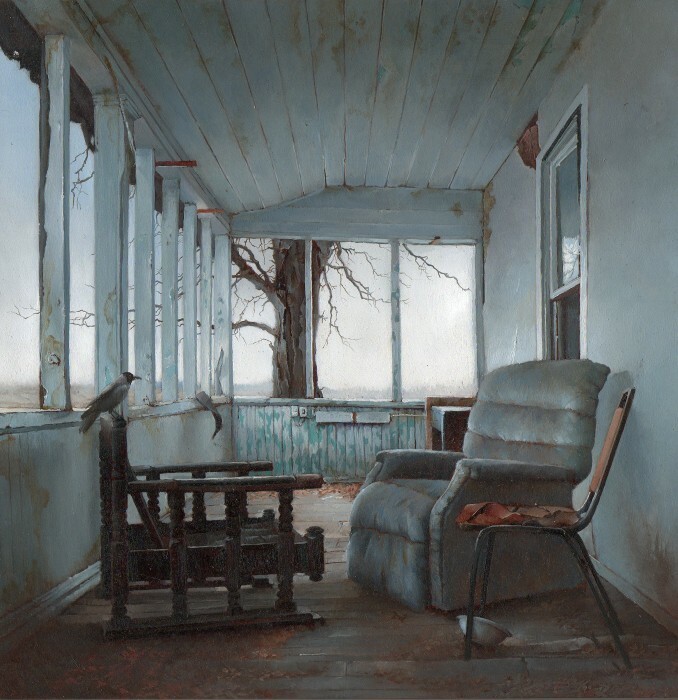 DB: I suppose for me an abandoned house is a metaphor for a dream gone wrong, a potential future failed. The living things present in these paintings are a symbol of the fact that life goes on—just because something didn’t turn out according to plan doesn’t mean that life stops in it’s tracks, it just happens elsewhere, or in other forms. These paintings are partially an act of salvage, a way to preserve the past and make something meaningful out of its remains. Golden, oil on mylar, 9 in. x 9 in. JDR: Who is an artist you thought of when working on this series and why? DB: When I was working on this series I was thinking a lot of David Foster Wallace, and his epic “Infinite Jest,” which deals, amongst other things, with dreams twisted and collapsed onto themselves, and with what can be salvaged from the remains. As far as visual artists go, probably Jan van Eyck and some of his Northern Renaissance contemporaries, whose compulsive attention to detail was a way of trying to communicate with something larger than themselves. JDR: That’s a really fascinating idea, that attention to detail is a way of communicating with something larger. Can you expand on how that idea influenced this series? DB: I tend to be compulsively detail-oriented in my painting practice—the longer I’m working on something, the more I end up thinking about the place I’m painting, either real or imaginary. I think eventually I start feeling like I know something of, or am communicating with, the past inhabitants of the places I’m painting, or at least the possible inhabitants of those places, as I imagine them.